To be sure, the science-fiction saga about our future fractious solar system has been very, very good to Abraham and his co-author for the book series, Ty Franck. Then there’s the TV show: The third season of “The Expanse” is wrapping up on the Syfy cable channel, and a month ago, Amazon picked up the show in dramatic fashion for a fourth season. That announcement was made at a space conference by none other than Amazon’s billionaire founder, Jeff Bezos, with the cast of “The Expanse” sitting out in the audience. Abraham has compared the writing business to a casino, and says that “writers are, among other things, professional gamblers.” If that’s so, he’s hit the jackpot with “The Expanse” alone. But that’s not his only play: He uses a different pen name, M.L.N. Hanover, for a long-running wizards-and-demons book series known as “The Black Sun’s Daughter.” Under his own name, Abraham writes fantasy novels (and has contributed to the “Wild Cards” graphic novel series). Abraham, who lives in New Mexico with his wife and daughter, wore yet another hat this week: He served as an instructor for the Clarion West Summer Workshop, which brings a select few writers to Seattle’s University District to sharpen their skills in speculative fiction. 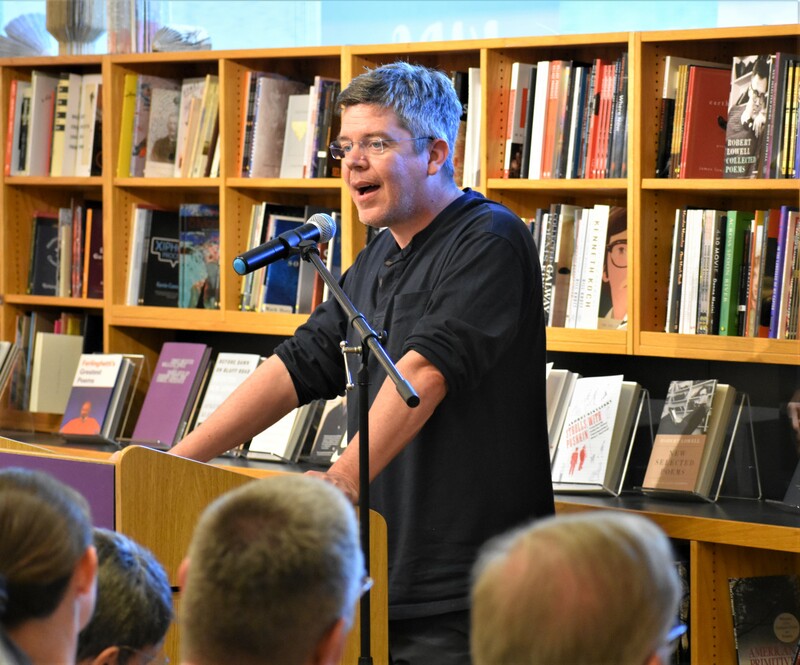 It was in that capacity that he gave a reading at University Book Store, and sat down in the store’s coffee shop before the reading for a Q&A with yours truly. Here’s an edited transcript of the talk, which started out with the revival of “The Expanse” TV series and ended up with a wide-angle look at politics in the Donald Trump era. Get the full Q&A on GeekWire. This entry was posted in GeekWire and tagged Books, Daniel Abraham, Science Fiction, Space, Television, The Expanse. Bookmark the permalink.